[Video] Ronaldo vs Messi All-Time Records Compared - Who's Your Guy? Messi and Ronaldo have completely dominated discussions revolving around the best player in the world for nearly a decade, a scenario the football world has never witnessed. Some observers have gone on record stating that they’re the best pair in history. Since the styles of Messi and Ronaldo differ greatly, comparing these two living legends often boils down to their on-field achievements, which include numerous trophies, awards and scoring titles. Some insist that it’s impossible to compare stars of this magnitude, with any conclusion a matter of opinion, instead of a matter of fact... So let's give it a shot and try to solve the everlasting question about Cristiano Ronaldo vs Lionel Messi rivalry: who's the best? Ronaldo has been tearing through the competition for slightly longer than Messi, who is a couple of years younger than the Portuguese striker. As such, Ronaldo has accumulated a greater number of goals and caps, earning 584 strikes in 844 appearances. Messi has managed to score 554 goals in 689 caps, producing at a greater goal per game rate. A greater rate of goal productivity is notable, but the biggest statistical divergence among the pair would be ball distribution. Messi has earned 228 assists, compared to 195 for Ronaldo, showing that the Argentinian has a considerable lead in terms of measurable teamplay. Other measurable stats agree with this trend: since 2010, Lionel Messi has averaged 2.15 key passes and 4.3 dribbles per game, while Cristiano Ronaldo has averaged 1.78 key passes and 1.84 dribbles. These numbers hint at the main perceived difference between the two. Messi’s tends to attack and distribute more often than Ronaldo. The latter’s build resembles a pure striker, giving him a big advantage in the air and in the box, while Lionel has a lower center of gravity, which allows greater agility on the turf. Since Messi has slightly better per game numbers and averages in all categories, he tends to be the best bet for those wagering on goal scoring or assist prop wagering activities. The statistical difference between the two isn’t a dealbreaker, so betting on either player will never be considered a bad decision. Start your odds shopping right now on our top recommended soccer sportsbooks such as Bet365 or WilliamHill. Befitting their superstar status, Cristiano Ronaldo and Lionel Messi have been responsible for championship teams throughout their entire career. If anything, this duo shines most while playing with their club sides compared to their international careers. Since 2004, either Messi or Ronaldo have been part of a team which has earned a major club trophy or team achievement. Cristiano earned his first big league trophy with Sporting Portugal in 2002, winning the Portuguese Super Cup. He made an immediate impact when he transferred to Manchester United, starting with an FA Cup win in 2004, peaking with a UEFA Champions League win. With Real Madrid, he earned a pair of UEFA Champions League titles, the latest in 2016, the same year he won the Euro. Other than an Olympic Gold, Messi hasn’t had a chance to make the same impact that Ronaldo has in international play. However, he has won one more UEFA Champions League title, earned the same number of world club championships, and far outpaces Ronaldo in league titles and domestic cup wins. He’s helped turn FC Barcelona into a dynasty over the past decade or so. Despite the fact that Messi has more major wins, Ronaldo has lead teams to championship in the Premier League and La Liga, something that could be considered more of an impressive feat. 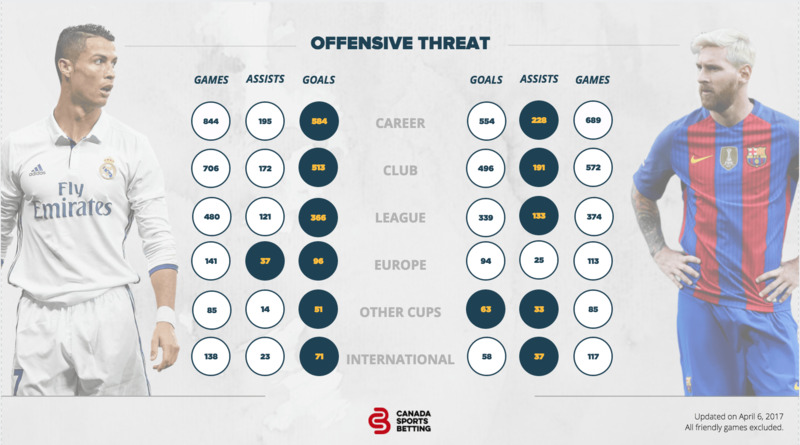 The EPL and La Liga represent different challenges at the elite level, and Ronaldo has shown mastery at the two highest leagues on the globe. Ronaldo and Messi have been atop the charts for top player awards for a decade, outshining all other performers with the exception of each other. Lionel and Cristiano have been keenly aware of the fact that they’re the sole rivals at the extreme elite level of the sport, aiming to prove their supremacy on the pitch. Despite being slightly younger, Messi has managed to clean up more individual awards than his counterpart. In particular, Messi has won five FIFA Ballon d’Or awards, including a run of four straight between 2009 and 2012. Ronaldo has won four Ballons d’Or, including three wins between 2013 and 2016. His first award was earned alongside teammates with Manchester United. Both players have won three UEFA Best Player in Europe awards, but Messi has more Golden Ball awards across competitions compared to Ronaldo. However, Ronaldo’s the only player to score four Golden Shoe awards, once in England and thrice in Spain. On the other hand, Messi has been the best assist provider six times, three times in La Liga and twice in the UEFA Champions League. This further underlines the difference between the skills and style of Messi and Ronaldo, highlighting Cristiano’s powerful finishing and Messi’s ability to lift the play of his entire team. When Cristiano Ronaldo and the Portuguese national team ran the gauntlet to a UEFA European Championship in 2016, he finally broke through on the international level, earning his first major trophy. True, Messi doesn’t have the opportunity to play in the Euro, but this shouldn’t detract from the fact that Ronaldo was a key member of a major international win. The biggest international win for Messi would be an Olympic Gold Medal in 2008, and a FIFA Under-20 World Cup victory in 2005. Argentina hasn’t even been able to win Copa América with Messi on their squad, finishing as runners-up to Chile and Brazil. In fact, the frustration has gotten to the point where Messi quit the national team after losing to Chile, before reversing his decision amidst a national campaign which included political leaders. Neither player has enjoyed much success with their national side in the FIFA World Cup, although Messi came close in Brazil, taking Germany to extra time before Götze put Argentinian hopes for global glory to rest. Ronaldo has experienced nothing but heartbreak during the last two World Cups, including an exit after the group stage. In terms of raw production, Messi has scored 58 goals and contributed 37 assists in 117 caps, while Ronaldo has 71 goals and 23 assists in 138 games. Unlike club play, Ronaldo has a better goal-per-game rate compared to Messi. Part of Lionel’s frustration likely takes place because of his reduced international production compared to the pro leagues. Perhaps the most important measure when it comes to comparing these two superstars involves the results that occur when they face each other on the pitch. Overall, Messi has a decisive edge, earning 14 wins head-to-head compared to 9 for Ronaldo. Incredibly, their performances have been in near lockstep in terms of goal production. Both have scored 17 goals over 22 games. The biggest lead that Lionel Messi holds over Cristiano Ronaldo would be their head-to-head stats during four games in the Champions League. Messi has scored three goals over five games while Ronaldo hasn’t found the net during this type of matchup. Lionel’s squads have won twice, while Ronaldo’s has a single victory. 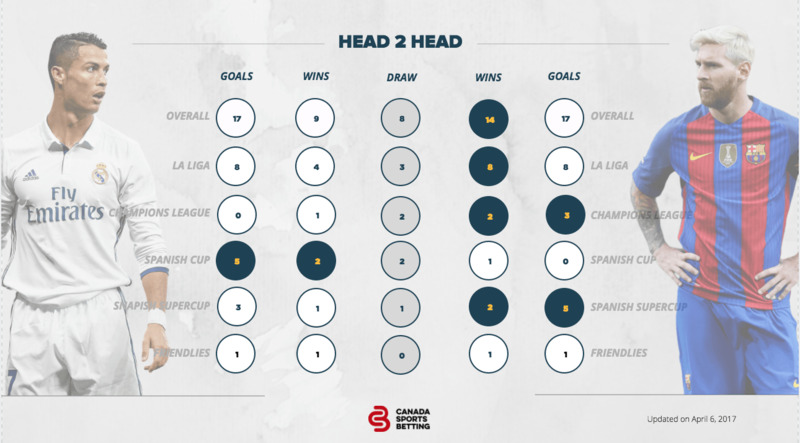 In La Liga matchups, Messi has double the wins despite scoring the same number of goals. Ronaldo has only outperformed Messi head-to-head during Spanish Cup competitions, scoring five goals to Messi’s nil. For the Spanish Supercup, Messi has outscored Ronaldo 5-3, earning a pair of wins compared to a single victory during this type of competition. These head-to-head statistics suggest that Messi has a strong advantage over Ronaldo whenever they play against one another’s teams. Considering Lionel’s expanded dribbling and distribution role, it appears that his ability create opportunities from nowhere and control the ball contribute more than Ronaldo. They have the same number of goals during their matchups, suggesting that Messi’s teamplay ends up being the deciding factor which elevates his game over Ronaldo.